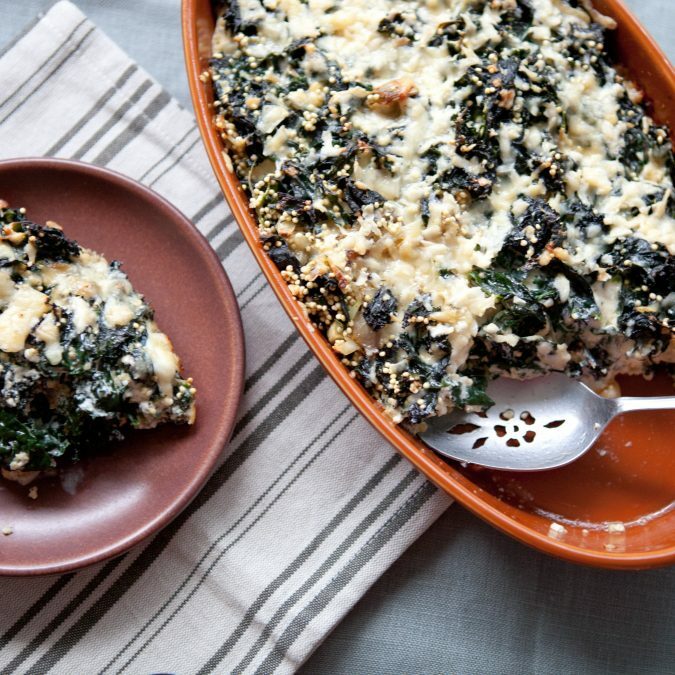 Use any winter greens you’d like for this recipe. I just happened to have kale (I used two kinds: lacinato and purple kale), but mustard greens or mizuna would be great and would add a little of their characteristic spiciness. Next time I make this gratin, I might scatter some bread crumbs over the top, or thinly slice a sweet potato and layer that in as well. The millet cooks most of the way in the gratin itself, so no need to pre-cook it: It will come out a bit chewy and a touch crunchy, which I really liked here. Lots of flavor; lots of texture. Preheat oven to 375 F. Lightly butter a 1 ½ or 2-quart baking dish. Soak the millet in a bowl of warm water while you set out to prepare the other ingredients. Boil a large pot of salted water, and add the kale. Cook until just softened, about 2-3 minutes. I did mine in two batches as all the kale wouldn’t all fit in our large pot. Use a slotted spoon and transfer the kale to a large bowl of ice water to stop the cooking. Remove from the cool water and, using your hands, squeeze as much water from the kale as possible and lay it out on good work surface. The kale tends to clump into balls when squeezed, so spend a few moments separating it and “declumping” it. Heat oil in a small nonstick skillet over medium heat until shimmering. Add the shallot and cook, stirring often, until translucent, about 4-5 minutes. Add the garlic and thyme, and cook until fragrant, about 1 minute more. In a large mixing bowl, combine the drained kale and cooked shallots. Drain the millet completely and add that as well. In a small bowl, whisk together the eggs, 1/4 cup grated Parmesan cheese, heavy cream, milk, nutmeg, salt, black pepper and chile powder. Pour the liquid over the kale mixture and stir well to combine. Turn out into the prepared baking dish and top with remaining 1/2 cup Parmesan cheese. Bake for 20 minutes, then increase the heat to 400 F and bake for an additional 10-15 minutes, or until cheese is completely melted, the top is browned and the edges are bubbling. Allow to cool and set for 15 minutes before serving. Cover leftovers and refrigerate for up to 3 days.